On the sunny shores of Mauritius, against the island's jade-like sea and blue sky, a unique scene is taking place. 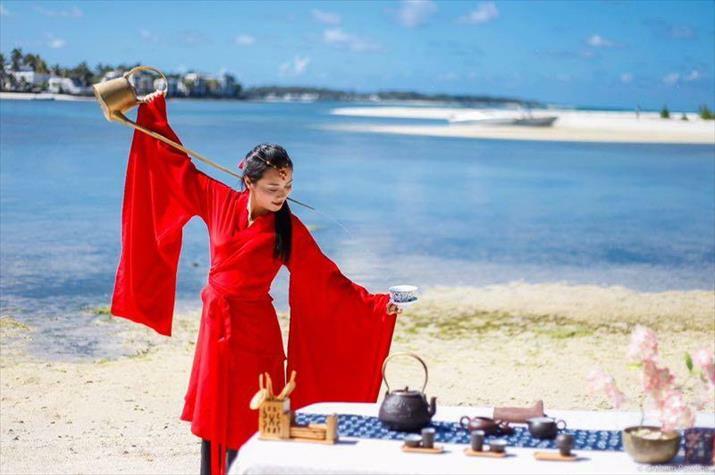 In a bright-red Chinese traditional silk dress, a young woman delights her guests by performing an elaborate and perfectly synchronized traditional tea ceremony. The public is mesmerized by her passionate but always elegant movements. In fact, her routine is so fluid and natural that the long-mouth teapot gives the impression to be an integral extension of her body. Some Mauritian guests even wonder: Is it really blood flowing in her veins, or could it be hot fragrant Chinese tea? In attendance was Jacques Li Chung, CEO of Chinafrica Stage Ltd. "She was beautiful in both her maturity and sincerity. I felt pulled in when I saw her performance. Her gracefulness goes well with the heavenly music. And all her movements had such precision and accuracy," he told ChinAfrica. This young woman is Wang Fei, a 30-year-old tea ceremony expert, on a mission to spread China's tea culture across the world, which took her from her hometown in rural China all the way to Africa. Wang has no idea if it is she who has chosen the tea or the tea that has chosen her. But one thing is for sure: Tea has always been connected with her life. Wang was born to a family of tea-pickers in a village in Ya'an City, in southwest China's Sichuan Province, in a setting of rolling hills of lush tea leaves. Local life there is deeply intertwined with tea plants, as this is a renowned place of traditional Chinese tea culture. Today, the village has been developed into a tourism destination famous for making Tibetan tea, known as Zangcha Village, or Tibetan Tea Village. "When I was a child, the conditions of my family were not so good. I grew up in my mother's pack basket, and I followed my parents as they went on the mountain to pick tea. I forged a deep bond with tea from that time," Wang told ChinAfrica. Wang went on to study the art of tea ceremony at university, and has been involved with tea ever since, eventually teaching tea arts at the Trade School of Sichuan Province, in Ya'an. Now, Wang is taking her passion overseas. She was appointed in 2015 as the promotion envoy of Sichuan to promote local Tibetan tea abroad. Since then, she has visited a dozen countries, and carried out over 100 tea culture promotion activities as far as South Africa and Mauritius in Africa. "I have the mission to let more people know about the tea of my hometown. Just like I love my parents, because they gave me life, I also love the tea of my hometown, because it gave me a soul," Wang said. A multi-ethnic city, Ya'an has over 20 ethnic minorities, including Tibetan. Given its geographical position, Ya'an is famous for producing Tibetan tea, which has a history dating back at least 1,000 years. Produced with tea leaves picked on mountains over 1,300 meters above sea level and using special technologies, it is believed to help digestion and revitalize energy in the cold and oxygen-poor environment of the Qinghai-Tibet Plateau with an average elevation of more than 4,000 meters. As a native of Ya'an, Wang hopes the Tibetan tea from her hometown could be known by more people worldwide. With this objective in mind, the young woman set foot on African soil for the first time on September 20, 2015, to perform a Chinese traditional tea ceremony called 18 Dragons at the closing ceremony of the 21st World Route Development Forum in Durban, South Africa. The 18 Dragons ceremony is regarded as a living fossil among the Chinese tea ceremonies, combining traditional tea ceremony, martial arts, dance and Zen elements. In this embodiment of a mysterious ancient philosophy, the performer's movements are meant to imitate those of a dragon. "This unique tea cultural performance is best able to present Chinese tea ceremony and tea culture," Wang said. Over the years, Wang performed such ceremonies for multitudes of tea lovers around the world. They are interested not only in traditional Chinese tea culture, but also in the meanings behind the ceremonies, she said. "Whether it is in China or African countries, tea is a way for people of different regions, skin colors, nationalities and cultural backgrounds to connect on a deeper spiritual level. It breaks through the language barriers," Wang told ChinAfrica. 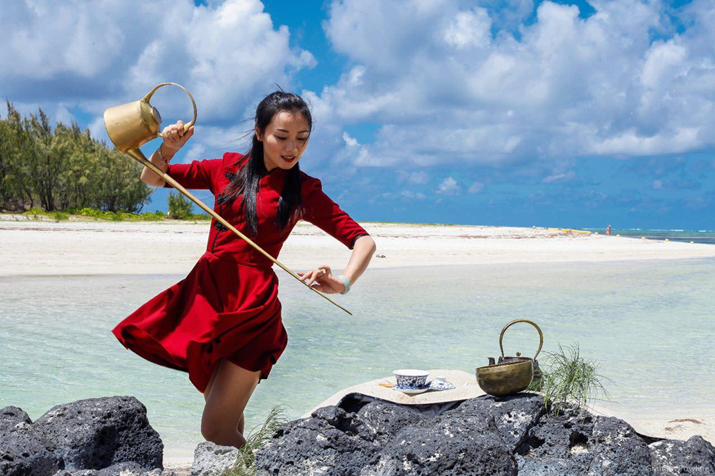 Many places in Africa have well-established tea cultures, but for Wang, it is Mauritius where she felt a real, deep connection. In June 2016, she was invited to Mauritius to perform as part of an intangible cultural heritage show and deliver a 12-day training session for local tea lovers. Without a moment's hesitation, Wang packed her luggage with 60 kg of tea and her long-mouth pot and crossed the Indian Ocean. "Africa is very welcoming. I could feel it was my destiny to combine tea with Africa," Wang said. "There is very high enthusiasm among Mauritius students for learning about our tea and tea culture." During the training, Wang introduced different kinds of Chinese tea and Chinese tea culture to local people. After class, her students repaid her generosity by taking her into a local tea garden. Among her students in Mauritius was 45-year-old Jacques Li Chung. As a third-generation Mauritian of Chinese origin, Li has always been keen to explore his ancestral culture. "But it was after witnessing Wang's tea ceremony and attending her training that really I fell in love with the Chinese tea and its culture," he told ChinAfrica. Li was particularly charmed by the Tibetan tea's unique fermentation process. Like wine, the longer the wait, the better the tea, explains Li. He was also persuaded by its health properties. "Once I knew the Tibetan tea, I felt it is miraculous. One of my friends had been suffering high-blood pressure and hyperglycemia, and I introduced him to the tea. After a few weeks, all his symptoms disappeared," Li said. This is when the idea of opening a Tibetan tea cultural center was born. Wang was Li's first and perhaps most enthusiastic supporter. "I wholeheartedly supported him in his plan. And I am willing to do everything to support him in the future," Wang said. On January 20, the Chinese Tibetan Tea Cultural Center was launched in Port Louis, the capital of Mauritius. Apart from selling authentic Tibetan tea, the center also trains locals on how to prepare Chinese tea and educate them on the health benefits of drinking Chinese tea. "The cultural center opens five days a week. We have people from all walks of life coming in to taste and buy Tibetan tea," said Li. Seeing that the Tibetan tea of her hometown enjoyed such a warm welcome from people in Mauritius gives hope to Wang. Every year, before Qingming, the fifth solar term in the Chinese lunar calendar that fell on April 4 this year, people in Wang's hometown are busy picking tea leaves, which are believed to be of superior quality because of the suitable temperature. 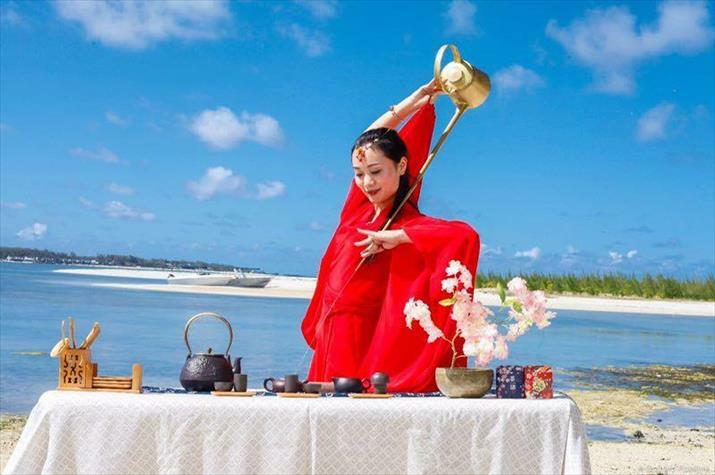 "The best thing is that people can get to know Chinese tea culture through cups of good tea in such a beautiful setting as Mauritius," Wang said. "I hope this will be the first stop on Tibetan tea's road to going global."